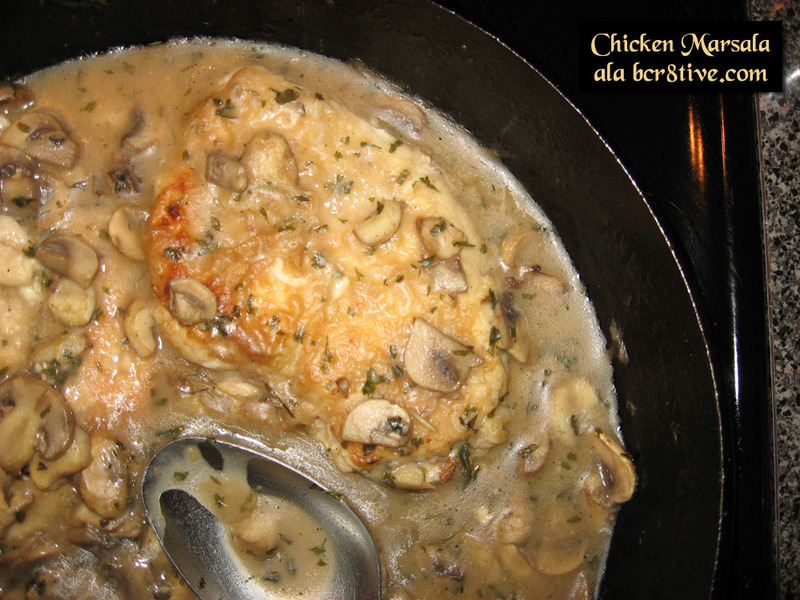 This is my personal recipe for Chicken Marsala. It is tried and tested and perfected until I felt that there was nothing left that I could do to it to make it better. (It is of course to my taste but also, per people I have made this for…) It has been well received and so I’ve decided to share it with you! This is best made in one pan. Everything from each step becomes incorporated into the final result. Most of the steps are simple, the roux though can be a tiny bit challenging, but as you make this, you get better at making roux. Roux is essentially equal parts fat and flour. In this recipe we’re going to mix part butter, part oil or smart balance with equal amount of flour to form the paste. (You can choose to use straight butter, but I find that it doesn’t alter the taste much to replace some of it with Smart Balance and it helps me to reduce the amount of cholesterol in the recipe for heart health). After the paste is complete, you will slowly add the broth, stirring it in so there are no lumps, like a gravy, and adding more broth a ladle at a time until it smooths out, and then you will add your wine and lemon juice, and the mushrooms and chicken back into it. Essentially that is it. I find preparing for it all is best. Have everything pre-made so you can focus on cooking. So first are the ingredients followed by the steps. I hope you enjoy it! Prepare all ingredients ahead prior to cooking. If you don’t have pre-made chicken broth, make 4 cups of STRONG chicken bouillon. Place chicken breasts in zip lock bags. Wash your hands well. Close to seal without air & then using a meat tenderizer, pound out until thinned but not broken apart. Prepare a wide bowl or dish for pressing the chicken into the flour, and adding some flour to another bowl, about a half a cup (at least 4 tablespoons) for making your roux. Also have a plate prepared with paper towel on it to set the cooked cutlets on. Prepare the green onions, and lemon juice and set aside. Prepare the wine in a measuring cup and set that aside. Have a plate or pan to set up your utensils in. You will need tongs, a flat spatula, a whisk or other tool to stir your roux and blend it. Remove from fridge, in a wide bowl or dish with flour in it pat the chicken breasts in the flour lightly. Flip it over pat it with flour on the other side, place it on a dry, clean dish. Do all of the breasts. Heat the pan to a higher medium heat (about 350) with it coated in cooking oil (about a fifth of an inch) just enough to brown the sides of the chicken quickly. Add the chicken cutlets – brown on one side and with tongs, flip them & brown the other side and then remove them from the pan and place on your reserved plate with paper towel on it. Drain the oil into an oil safe container. Set the chicken aside. Use the flat spatula to scrape the crispy bits into the pan. Now add 4 tablespoons butter to the same pan, melt it and cook the mushrooms on medium heat (about 300-350) continually stirring & flipping with a flat spatula until they begin to brown. Do not cover them so that they do not get wet. Just before they are starting to brown to completion throw in the green onions, keep flipping the mushrooms and onion until the onion starts to get a little bit soft. Quickly remove the mushrooms and onions from the pan & set them aside. Scrape with the flat spatula again to incorporate all of that good flavor from the bottom of the pan. Do this quickly as you turn the pan heat down… & temporarily remove the pan from the heat. You lower the heat so that you can work quickly but are not rushed. Going to add 4 tablespoons of flour but only one at a time sprinkled over the melted butter, and you’re going to stir it like crazy to make sure that it has no lumps, before you add more flour. I tip the pan so the butter is all in one corner, and sprinkle the flour in 1 tablespoon at a time, blending it in. You should have a nice smooth sauce going now. Turn the heat down to low though to like 150. Stir well and add the mushrooms and onions back, stirring them all in – then add the chicken breasts back… spoon sauce and mushrooms over the chicken. Cover. Cook on very, very low for about 20 minutes. You can check it and stir a little bit one or two times. On the side you could make red whipped potatoes, roasted garlic mashed potatoes, or pasta, spinach and artichoke hearts, etc. 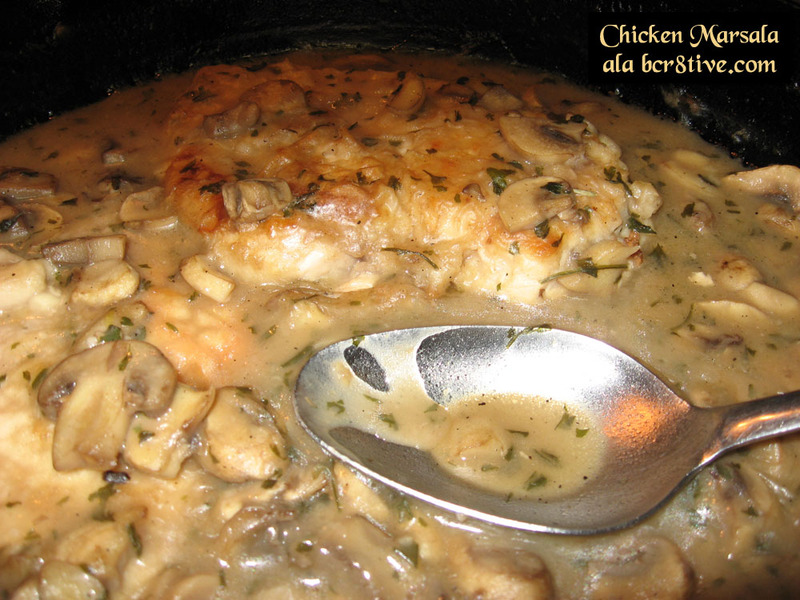 to pair with this Chicken Marsala. You could make an egg noodle side dish mixed with some spinach and artichoke hearts and spoon some of the mushroom sauce over it. The sauce is amazing. You might want to just eat the sauce.